You are currently browsing the tag archive for the ‘Technology’ tag. Indiana’s Deputy Attorney General Jeff Cox has been fired for using incendiary language on his personal Twitter account. The Indiana Attorney General’s office issued a statement Wednesday that after a “thorough and expeditious review” of the situation, Cox would no longer employed by the state and that public servants should strive for civility. According to the United States Department of Commerce, broadband access and adoption is lagging in rural America, and large swaths of central and eastern Kentucky have little to no internet access. A recent study found that about 40% of rural households use broadband internet service, while roughly half of urban households are online. About 28% of all Americans do not use the Internet at all. We’ve discussed broadband here before (many, many times). Often, our posts about broadband deal with the difficulties getting it in rural areas. Providers and customers both face difficulties, and Apple co-founder Steve Wozniak has experienced the latter firsthand. He writes about it in a piece for The Atlantic. The essay’s main focus is net neutrality, which most cable providers have been fighting. Who Are You? Who Could Tell? State Representative Rick Nelson has pre-filed legislation that would require…someone to disclose (upon request) the names of people who post anonymously online. But who is the provider? Is it the ISP or the host? It’s also unlikely this could pass a legal challenge or apply to out of state residents, hosts and ISPs. Page One has more, and it seems that Jake is no fan of Rep. Nelson. Unlike most published virtual tours that feature businesses and attractions, Paul’s app gives users instant access to photos of – and details about – hundreds of houses in Old Louisville. Louisville has the third-largest historic district behind Boston and Soho in New York City including the historic district around St. James and Belgravia, site of the annual St. James Court Art Show, Louisville’s nationally famous arts festival. But Louisville has the largest collection of Victorian architecture in the United States plus two neighboring local historic-preservation areas, the Limerick neighborhood and University of Louisville’s Belknap campus, Paul said. Feel free to complain about how this is become an Apple news blog. In the past 24 hours, we’ve brought you news about the iPad, the iPhone and the iSag, which you wear under your turtleneck to hold your jeans up. Several incoming Congressmen are pushing to allow iPads in the House. “There will be the ability to have real-time information brought to the floor in a readable, usable format. A member could make a factual statement, and someone with an iPad could say, ‘No, your data is two years old.’ All of a sudden, you have a member being able to one-up someone speaking on the floor,” said Frantzich. There is also a proposal for legislation to be transmitted electronically to members, instead of printing copies every time. The House currently has a multimillion-dollar printing budget. I recently saw a member of congress with an iPad. I asked if he could read bills on it. He said “No,” then sighed. There have been a few instances in the last year where the local Twitter-verse and Facebook-sphere (not a real phrase) have lit up to find a person who has stopped checking in, calling friends or showing up to work, class or events. The Atlantic looks at how social media can be used to find missing people…though some folks have taken issue with how difficult it can be to work with law enforcement on issues like this. The Todd County Standard in Elkton, Kentucky has run a series of articles on the need for high-speed broadband in rural areas like Todd County. Recently, though, the issues has made it to the paper’s editorial pages. In an editorial this month, the paper said that “despite the best efforts” of the top county official and the county’s two state legislators, the county still lacks broadband and is “losing the race toward the future” even though Kentucky leads the nation in funding from the Broadband Inititatives Program of the Department of Agriculture. With both candidates for mayor pitching smart phone applications, it should be mentioned that there once was a Louisville iPhone app. 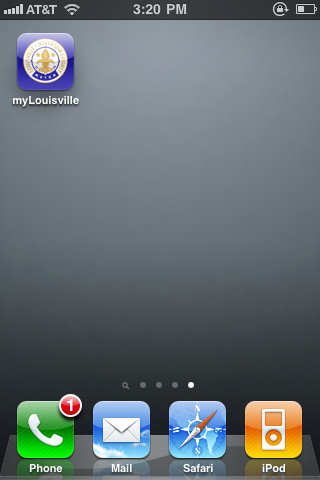 The “MyLouisville” application was not affiliated with Metro Government. It was programmed independently by developer Splaysoft and featured a map, social network, news feed and flag and fact display (pictured). Richard de los Santos with Splaysoft says the MyLouisville app was removed during a recent sweep of the App store, but will return as part of a multi-city app. “…people can snap pictures of neighborhood problems then e-mail them, with geocoding, to the city,” says Democratic candidate Greg Fischer‘s plan, which was unveiled this week. What would you want a Metro Government application to do? Provide TARC information? Let you report crimes? Give news updates? Of course, many citizens won’t be able to access a smart phone application, and many others won’t even be able to access the city website, so applications aren’t the centerpiece of any candidates’ platform. On his Info Vegan blog, open-source information advocate Clay Johnson rails against online petitions and the advocacy groups behind them. Most of the time, the organizers don’t follow up on the petition, some of the time the vendor has some kind of bug and they don’t end up being delivered. If and when they do go end up getting delivered, members don’t read them. There’s no possible way they could — according to the Congressional Management Foundation, the House of Representatives got 99,053,399 messages via the Internet in 2004. That’s 227,708.9 messages per member of Congress. If a member took an average of 30 seconds to thoughtfully read each email they received in 2004, it’d take them 79 days solely to read their mail from the Internet. For a member of the Senate it’s worse: 288 straight 24-hour days worth of constituent communications at 30 seconds a piece. Most people don’t spend that many hours awake in a year. In short — sometimes the mail doesn’t even get there and when it does, it rarely gets read. So why do organizations tell you to write your members in the first place? Because politicians and advocacy groups value your email address over your voice. It’s the great lie of online organizing: that your voice to Congress or your voice to whomever can make a difference. It can, it should, but not through them. Nearly every organization in Washington is focused on one thing — inventing new and interesting ways to get your email address. And they want your email address so that they can ask you for money. Johnson admits that petitions can help political candidates who need e-mail addresses and money. He further says that claiming to have thousands of supporters is impressive. Plus, petitions can raise awareness. It’s all about what’s done with the names and sentiment, though, and, as Johnson points out, the opportunities are often lost. Your thoughts? If enough people comment on this post, maybe I’ll start a petition to stop online petitions.